We are well into the month of August now…. and with August comes all the preparing you need to do for Back To School. Well, today’s craft is perfect for back to school as I am going to show you how to Decorate a Notebook with Paper Squares. 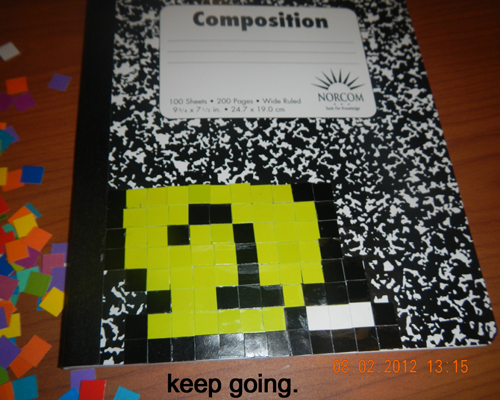 Take an ordinary cheap notebook and decorate it with your favorite character or design. 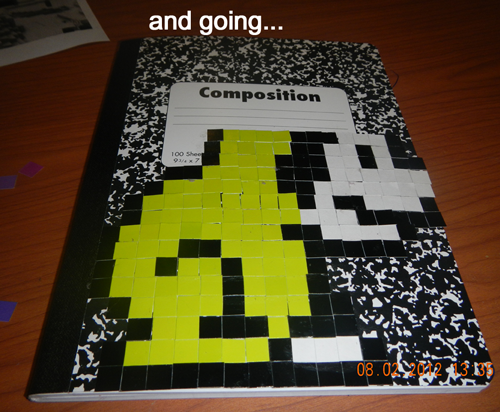 You will be sure to have the most original notebook at school. So, grab the materials needed and let’s get started. Check out our other Back to School Crafts. 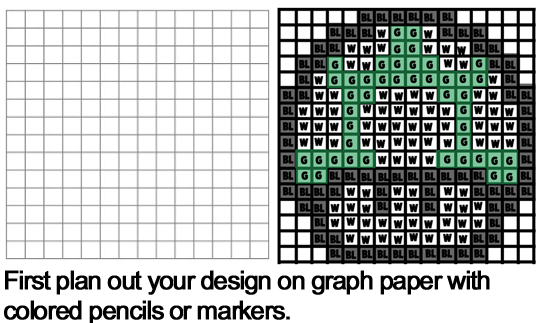 First, plan out your design on graph paper with colored pencils or makers. 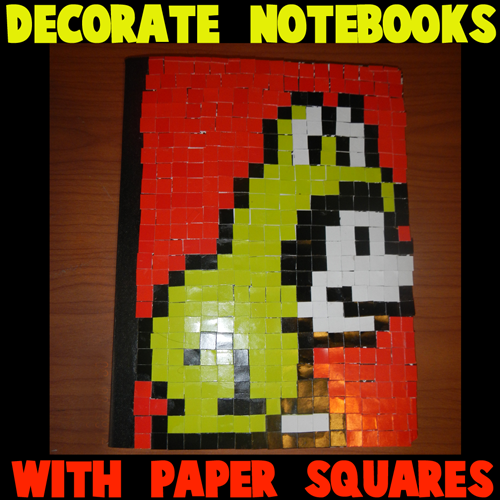 If you need some ideas for art you can make with squares check out these Perler Bead Crafts as well as these Mosaics. 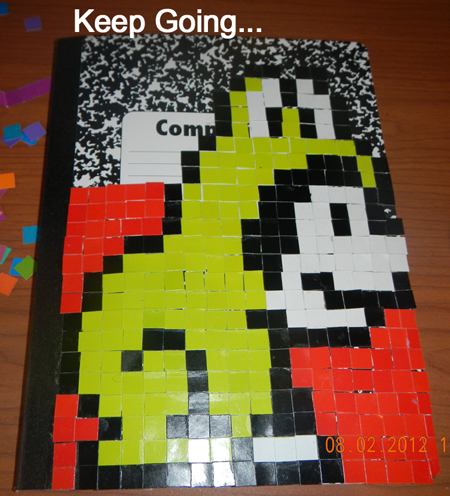 Both the Perler Bead Crafts and Mosaics are made from squares and you should have plenty of ideas to choose from. 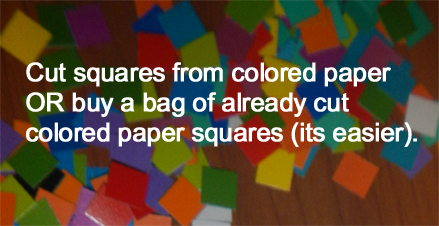 Cut squares from colored paper OR buy a bag of already cut colored paper squares (It’s easier). 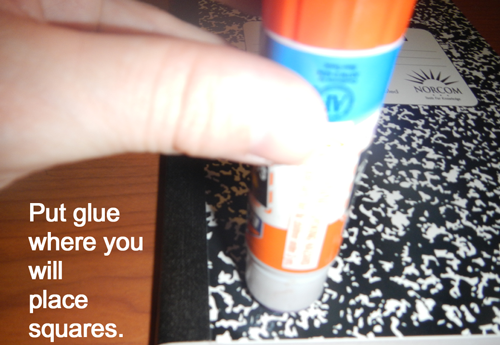 Put glue where you will place squares. Next step is the red background. Keep going until the background is finished. Excellent Job!! 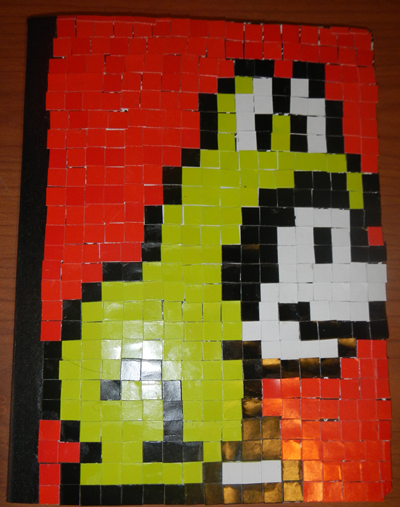 You just finished Decorating a Notebook with Paper Squares. 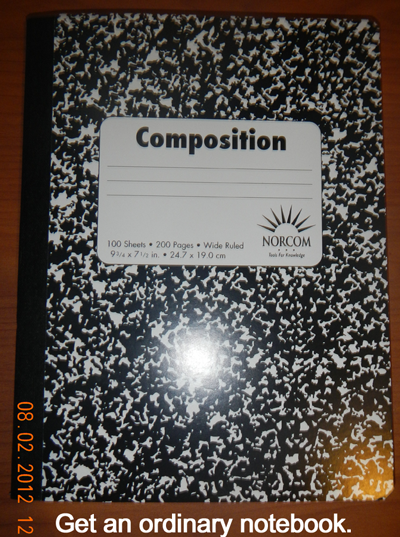 You are surely going to love taking this notebook back to school to show all your friends. 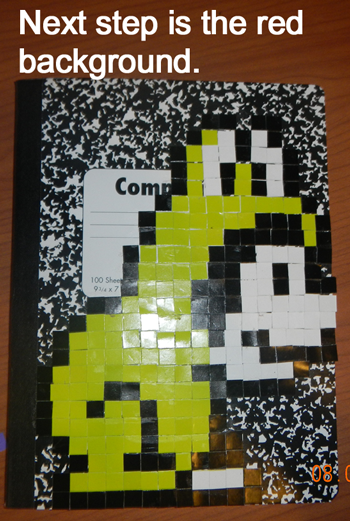 Let me know how your decorated notebook turned out in the comments below. And, don’t forget to take a picture of it too…. you can add that to the comment as well. Hi! I was looking around on the internet for fun, easy crafts! [I’m in Girl Scouts, my job is to look for crafts.] So, I thought this one was perfect! One question, where to find graph paper the size of a regular composition notebook? And, how many squares did you use in the end, and you used construction paper?… K, thanks!!! Email me reply!! thanks! Thats a cool job you have! That is a great question. The graph paper is just for mapping out your design. Decide what size paper squares you are going to use. 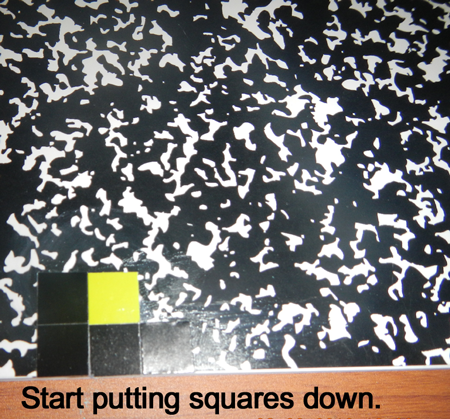 Then find out how many squares wide and tall your notebook is (for example 20 squares wide by 30 squares long. Then use ANY graph paper (doesn’t matter what size) and use 20 squares wide x 30 squares long on that graph paper to decide what your drawing will be. It doesn’t have to be the same size, as long as you know where you are going to place your squares. Does that make sense? If not, I can make an illustration to describe it for you. You had an admirable job…you are already doing a great job!